I don't think I'm alone in wishing there had been a bit more Sif in Thor: The Dark World. 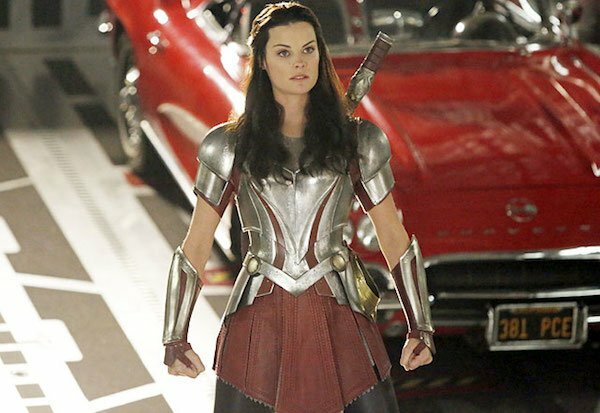 Marvel is kind of making that up to us by putting Lady Sif in an episode of Agents of S.H.I.E.L.D., and we now have our first look at Jaimie Alexander all suited up and looking ready for action. We've known for a couple of weeks that Jaimie Alexander was set to reprise her role of Lady Sif for a guest appearance on Agents of S.H.I.E.L.D. in Episode 15 of the ABC seriers. TV Guide has given us our first look at her in the series -- Coming Soon shared a slightly bigger version of it. -- and it looks like she's standing in front of Coulson's beloved Lola. As for what the Thor character will be up to, TV Guide says Coulson's team will be facing Elena Satine's character Lorelei, "a deadly, flame-tressed vixen" featured in the Thor comics. It sounds like a situation that would require the help of a warrior goddess and Sif fits the bill! S.H.I.E.L.D. executive producer Jed Whedon says that Sif is sent by Odin to track down Lorelei, who's her arch-enemy, and bring her back to Asgard. "It throws our agents for a loop when they find themselves in a fight right alongside this powerful woman from Thor's world," Whedon goes on. I like to imagine that there would be a bit of geeking out on the part of some of the S.H.I.E.L.D. agents when they get to meet her. Sure, May would play it cool, but FitzSimmons? I imagine they'd be very excited to get to meet this Asgardian face to face... assuming they do. It's going to be very exciting to see Lady Sif in action on the series and what kind of effect she has on the characters and the story at this point in the series' first season. This won't be the first Thor nod we've seen on Agents of S.H.I.E.L.D. as the sequel was addressed during a previous episode of the ABC series, titled "The Well', and we might expect even more Marvel cinematic crossover, as Clark Gregg recently spoke about how the events of Captain America: The Winter Soldier will factor into Agents of S.H.I.E.L.D. down the line, specifically as it relates to the CENTIPEDE and Clairvoyant plot. As for Alexander, Episode 15 won't air until March, as it looks like we're amidst another mini-hiatus for the series. We're in for reruns in the weeks ahead, but the series will be back on the air with new episodes in March. You can read our breakdown of last week's episode here.